REELRADIO - The Rob Calhoun Collection! Rob Calhoun (RadioRob) says he's loved radio since he was born. 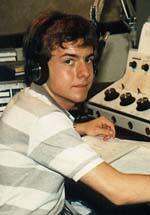 I got my start at simulated bigtime radio when I was 16 years old. I was entrusted with the coveted Sunday Morning Drive Time Shift at WVLK in Lexington, KY. I was the one who ran "The Christian Hour", a program which ran only fifteen minutes and played gospel favorites like "Tennessee Ernie Ford sings with The San Quentin Prison Choir." I graduated from that to being an all-around utility dude. My first chance for normal hours was at WVJS in Owensboro, KY., the place to learn how to do radio  and I did  becoming afternoons and Assistant PD. Sadly, I entered this business during deregulation and the Telecom Bill. After four years, a new GM eliminated my position for automation. I wound up working for The Cromwell Group's WKCM/WLME in Tell City, IN. Details of that time of hell could be used as a screenplay for "Pulp Fiction II". I stepped away from radio for a bit only to return to CHR 96STO (WVJS' sister) Evansville, IN/Owensboro, KY. First middays and then to nights (my dream gig). Life was nice but the Telecom Bill headed its ugly rear once again. The new owner hired a GM who was able to do what a fire in 1964 and a tower collapse in 1983 couldn't do: bring WSTO to its knees! I was staff casualty number 25, I think. After a two week vacation through the North Carolina mountains and coast scanning the radio dial, I determined radio was a "vast wasteland" with a few exceptions like Jackson Armstrong at Oldies 93 in Winston Salem, NC. I returned to Owensboro and went to work with my former WVJS boss Joe Lowe. I handle audio/video needs for The Executive Inn, a 640 room hotel/convention center and do freelance voice work. The Repository thanks Rob Calhoun for sharing!
. . . My name is Gary, I'm kinda hairy . . .
Gary Burbank was not only the number one afternoon jock in Louisville during this time, but (at times) the number one afternoon jock in Lexington, 75 miles to the east. He's great today on WLW in Cincinnati. But back then he was running on Turbo Blue. On this aircheck of WAKY from the Summer of 1973 and the Spring of 1972, you'll hear Burbank plastered, doing one of those public service drunk driving stunts.
. . . I took this job because they sing my name . . .
Just a typical summer night in the life of the Big 89; a great contest (a ticket a minute to see the Rolling Stones); John Records Landecker full of energy and a Boogie Check.
. . . fooled ya! . . .
JJ Jackson is here, but no jingles are to be found on this aircheck of "Quixie" which sounds like it was recorded off the WQXI air monitor. The station is still very hit intensive so it sounds like the steam was still there competing with FM.
. . . This is Dusty on duty . . . The Top 40 world as WSAI 1360 knew it ended with Randy Michaels' arrival to the Queen City. Michaels programmed Top 40 on FM with Q102 around 1975 marking an end to WSAI's dominance. Michaels left the market a year later to program sister station WDAF in Kansas City. He changed the format from Middle Of The Road to Country. Michaels returned to Cincinnati in the summer of 1978 to lay his programming hands on WKRC-AM (55KRC). Much like WDAF, 55KRC was playing Middle Of The Road music and suffered ratings problems. Rumors were strong that Michaels was planning to change 55KRC to Country. In reality, the presentation was updated to what we now call "Hot AC". But WSAI's management believed the rumor and decided to beat Michaels to the format. On August 22, 1978 at six A.M., WSAI 1360 changed formats from Top 40 to Country. This aircheck is from the evening before, a "Goodbye to SAI". Former WSAI night personality Dusty Rhodes was brought back to ride WSAI into the Top 40 sunset.
. . . Froggy, froggy everywhere . . .
Q102 (WKRQ-FM) nighttime jock Mark Sebastian's battle cry this time around was The Frog is Dead. The Frog was the mascot of album rocker WEBN. Sebastian did his own version of the SNL "Larry The Lobster" bit. He took listener's votes to find out if they wanted him to grind a frog up in a blender. The next night  as Randy Michaels put it  "What's green and goes a hundred miles an hour? On this recording from March 16 & 17, 1983, you will hear Sebastian, late night jock Janeen Coyle, and Michaels bid farewell to the little froggy.
. . . We're leavin' the square - the cops are after us . . .
Q102 was one hell of a listening experience. By name it was a CHR, but it played a lot of oldies. It was nothing to hear House of the Rising Sun and Shalamar in the same quarter hour. Back in those days, it was a party atmosphere 24/7 at 1906 Highland Avenue. At the time, WEBN's studios were in the Hyde Park township of Cincinnati. So Q102 decided to make a Friday night visit to Hyde Park Square and invite listeners to meet them there and honk their horns in protest of WEBN. And as an added bonus, if you showed up with underwear on your head, you'd get a Q102 T-shirt. Did I mention they did this without the permission of anyone  like the cops? On this you hear Mark Sebastian, Randy Michaels, Chris O'Brien and others.
. . . Missouri's Amazing A.M. . . . This is a reminder of what radio was like in some small towns before satellite and automation. I read on a defunct web site a while back that KYMO was a barn burner. It was a 500 watt daytime CHR, used JAM jingles and did things right. It held on to a contemporary format until the mid-eighties. Skipper T. (Skip Spence) has made a few comments on this site and was in Evansville radio a couple of years back doing a weekend shift at Oldies WJPS. He really smoked with the format getting into it better than some of the full time jocks. What can I say, he made me turn the radio up and jam!
. . . And he broke in on the Reverend's message, yelling pistoleros!, and you could hear the bullets . . .
All that power  sources claim up to a million watts at times  spread the word about the magic of goat glands that increase virility. It was also during those years the Border Blasters gave much of the world its first exposure to Country and Soul music. The advantage of working for an NPR affiliate is when you heard a story that's worth keeping, you record a later feed. I stayed late that night to catch this audio gem. 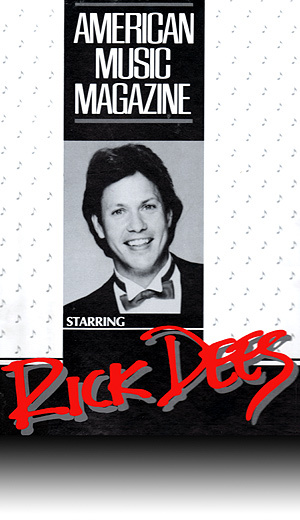 From Thursday, May 15, 1986: Rick Dees plays the most-requested songs. The in-studio guest is Mike & The Mechanics. From Friday, May 16, 1986: Rick Dees plays the most-requested songs. The in-studio guest is Gloria Esteban & Miami Sound Machine. From Columbus Day, Monday, October 13, 1986: Rick Dees plays the most-requested songs. There's a Concert Calendar, for historic reference to live music performances all over the country at the time. This direct-from-vinyl syndication disc includes wonderful national spots for Doublemint Gum, Certs, and several others. There's an appearance by Groanin' Barrett, a Close-Up of Billy Idol and staff member Kenny using a pay phone. 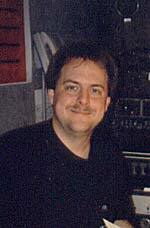 The Rob Calhoun Collection has been part of REELRADIO since May 7, 2000! Reel Top 40 Radio Repository ©1996-2015 REELRADIO, Inc.